​​In September of 1998, 76 positive cases of rabies were diagnosed from 55 towns in 11 counties across the state. Included were 46 skunks, 19 raccoons, 5 bats, 4 cats, & 2 woodchucks. A positive was found in Ashland, right next door. Please educate your children about the dangers of petting wild or stray animals. Do not attempt to feed, touch, or capture wild animals, even if they are just babies. Moms don’t appreciate it. If you are having trouble with a particular animal, contact your local animal control. Don’t take matters into your own hands. Tips for avoiding contact include covering trash containers securely and not leaving food out where it may attract wildlife. 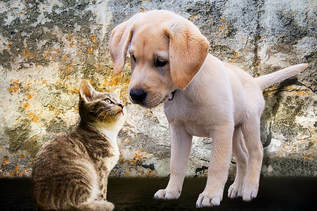 Remember, if your pet comes in contact with a wild animal or has a wound of unknown origin, we need to see him or her immediately to review their rabies status and re-booster. The state takes Rabies very seriously and so should you. Keeping your pet vaccinated can save his or her life! Ticks can carry Lyme’s and other tick borne diseases. They are not always easy to spot, so during the peak of tick season it’s important to check your pets at least twice a day. Peak season is beginning now and lasts until late fall. Using forceps or tweezers, grasp the tick quickly as close to the skin as you can. The quicker you grab it, the less time for it to bury it's head deeper under the skin. For dogs only, you can apply Vaseline or Tea Tree oil. This will cause the tick to become weak. If the head is left in the skin, it may cause inflammation but usually will scab over and peel off within a few days. Clean the area off with some hydrogen peroxide and then you can apply some Calendula gel. We recommend giving Ledum 30C weekly during tick season to reduce the chance of infection from any ticks. If you pet shows signs of 1 or more of these symptoms, contact your veterinarian. The sooner diagnosis and treatment can begin, the sooner your fury friend will feel better. Heartworm is a disease that is passed between dogs through mosquitoes. It is a parasite that can cause large worms to develop in the chambers of the heart and adversely impact the heart. It is an easily prevented disease with proper care and prevention. To best protect your pet, it is important to have an annual blood test and preventative medication during the mosquito season. Here in New England, we have the benefit of cold weather that limits the mosquito season and the need for year-round prevention. We will work with you on an individual basis to guide you on the best way to administer. We are presently testing heartworm in the late spring with a test called AccuPlex 4. This test screens for heartworm as well as tick borne diseases (Lyme, Anaplasma, and Ehrlichia) popular in our area. Healthier bodies and immune systems are more resistant to becoming infected. But it is critical to test for and prevent this disease that is very harmful to your pet. Well not really sugar, but have you gotten really creative? Many of the calls that we get are how to get pets to take the supplements and powders. Only mix supplements in regular dinner when you are sure the pet will eat them. We don’t want to discourage your pet from eating well. Add treats to mix meds in, things that have a strong smell usually work best; sardines, dark tuna in oil, and liver are very popular. Some people have success with peanut butter, cheese balls, yogurt and cream cheese. You may also try baby food in jars. Giving your dog a treat first that does not contain the medicine will often lower their guard enough to get them to gobble the next morsel. Some clients have had success making a liver or sardine “frappe” that contains the days supplements and syringing it in. *This list is for your consideration when shopping for quality prepared dog foods. Not all foods listed are equal in quality. It is by no means all inclusive. There may be other brands that are equivalent. Each dog has individual dietary needs, and there is not one food that can be used exclusively to meet these needs. It is important to read labels and if necessary contact the food manufacturers to obtain necessary information about prepared dog foods. *This list is for your consideration when shopping for quality prepared cat food. Not all foods listed are equal in quality. It is by no means all inclusive. There may be other brands that are equivalent. Each cat has individual dietary needs, and there is not one food that can be used exclusively to meet these needs. It is important to read labels and if necessary contact the food manufacturers to obtain necessary information about prepared cat foods. Dry food should be fed minimally, if ever. We believe that a well-balanced, fresh organic raw diet with appropriate supplements is the best for your cat.